When Jessica McCulloch graces the basketball court, she takes over games. 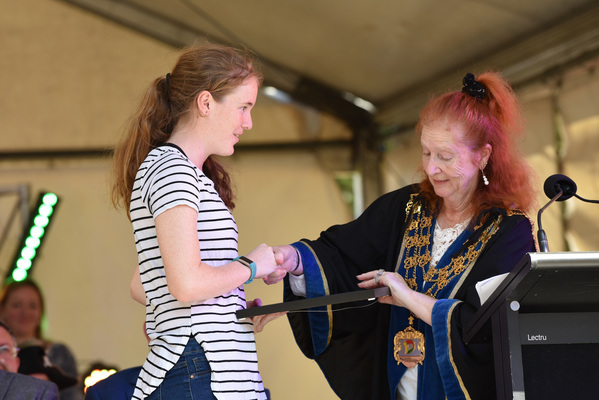 Because of that, it was a surprise to very few people when she was named Sportsperson of the Year at Greater Dandenong Council’s Australia Day awards last Saturday. After beginning playing basketball when she was eight years old because her friends at school were playing, McCulloch has truly found her calling on the hardwood. McCulloch, a 20-year-old Special Olympic Basketball athlete, who plays locally for the Dandenong Casey Titans, has not only represented her state – a stunning achievement in itself – she’s also travelled the world pulling on the green and gold for Australia. McCulloch represented Victoria at the Special Olympics National Games in 2014 and 2018, winning silver and gold respectively and in 2015, she helped lead Australia to gold at the Special Olympic World Games in Los Angeles. 2015 was a big year for McCulloch, not only did she travel to America and win gold, she also headed to Ecuador for the INAS Global Games. Whilst 2015 saw her travel the globe, 2018 was when she really took over the basketball scene with a dominant display at the 2018 Ivor Burge Championships – a tournament that sees the very best intellectually disabled players in the country compete on a national stage. McCulloch was a woman on a mission – not only did she lead Victoria to a gold medal, she put up ridiculous numbers along the way too. In their final game, she poured in 36 points and grabbed 15 rebounds in a performance that had to be seen to be believed. After a dominant 2018, McCulloch has her sights set on an even bigger 2019. She will be competing once again at the Ivor Burge Championships, held later this month at the AIS in Canberra, and is currently in trials for the Global Games in Brisbane later this year. McCulloch would like to thank all of her coaches, teammates and supporters for their help over the years.